Star Micronics presents CloudPRNT, an innovative technology enabling users to print to Star printers directly through a cloud service. CloudPRNT will work with the online ordering service to store and create print jobs, and communicate status with the printer. Cloud ordering services will post orders using a JSON format while the Star CloudPRNT printer will pull these orders on a defined interval. 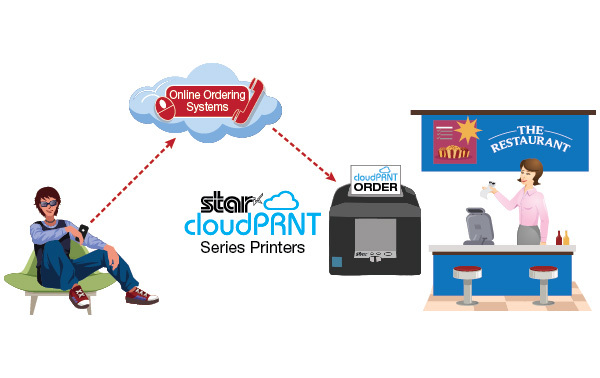 Star’s CloudPRNT technology provides benefits to both restaurant and retail stores alike by eliminating the need for an extra tablet to send an online order to the printer. Instead, the ordering service will be able to communicate directly to the printer. The store owner or service providers do not need to maintain an SSL certificate for this CloudPRNT printers since the printer communicates with the server as a client. By offering online purchasing options, retail stores and restaurants will be able to grow their business to expand to a larger market. Using CloudPRNT, online ordering systems have a new and easier solution to offer businesses, allowing them to seamlessly integrate online purchasing into their stores. Star's TSP650IICloudPRNT thermal printer retrieves and prints online orders from any online ordering service integrating Star's communication protocol. With ultra-fast print speeds, small footprint, and swappable interfaces options, the TSP650IICloudPRNT is ideal for QSR, deli, and fast-casual environments that accept online orders, in addition to order online - pick up in store retail locations. Star's TSP700IICloudPRNT is ideal for servicing label printing for online orderings ranging from labels on take-out or delivery food orders to labels that will be added to an online retail order.The TSP700IICloudPRNT supports 2D barcodes, and has a rugged design, making it more difficult for dist or liquids to penetrate and harm the printer. The TSP800IICloudPRNT is ideal for wide format printing of receipts or invoices that require a large quantity of information. The TSP800IICloudPRNT provides the perfect solution for delivery environments in which the order is placed online and the receipt or invoice is included in the box for delivery. Star's SP700CloudPRNT is specifically designed for accepting and printing online food orders in the kitchen where heat and humidity can erode the type on the printed order. This fast, two-color printer offers crisp, easy-to-read type for quick viewing, and will automatically print orders as they are placed through an online ordering application. Hardware Configuration Star CloudPRNT is a hardware extension of Star's printer using a protocol to enable printing from remote servers. CloudPRNT is designed to be simple to implement, versatile, and secure. Data Specifications All CloudPRNT communication is handled via a single URL, which can be hosted by any web server. Clients (HI0X) will use an http POST method to update device status and make requests at a fixed interval. The server will respond with instructions and details of available print jobs. 37966980 Thermal 3 YR Swap-A-Star Extends standard warranty to total of three (3) years and includes next business day replacement. Valid in US & CA only. See terms & conditions for details. 37967000 Thermal 4 YR Extend-A-Star Extends standard warranty to total of four (4) years. Valid in US / CA / MX / ROLA. See terms & conditions for details. 37967200 Thermal 3 YR Extend Limited Adds one (1) year limited warranty to standard warranty. Valid in MX / ROLA. See terms & conditions for details. 37967210 Thermal 4 YR Extend Limited Adds two (2) years limited warranty to standard warranty. Valid in MX / ROLA. See terms & conditions for details.